Saving entity data in the connected scenario is a fairly easy task because the context automatically tracks the changes that happened on the entity during its lifetime. Here, we will use the same EDM for CRUD operations which we created in the Create Entity Data Model chapter. An entity which contains data in its scalar property will be either inserted, updated or deleted, based on its EntityState. In the Entity Framework, there are two persistence scenarios to save an entity data: connected and disconnected. In the connected scenario, the same instance of DbContext is used in retrieving and saving entities, whereas this is different in the disconnected scenario. In this chapter, you will learn about saving data in the connected scenario. The following figure illustrates the CUD (Create, Update, Delete) operations in the connected scenario. As per the above figure, Entity Framework builds and executes INSERT, UPDATE, and DELETE statements for the entities whose EntityState is Added, Modified, or Deleted when the DbContext.SaveChanges() method is called. In the connected scenario, an instance of DbContext keeps track of all the entities and so, it automatically sets an appropriate EntityState to each entity whenever an entity is created, modified, or deleted. Use the DbSet.Add method to add a new entity to a context (instance of DbContext), which will insert a new record in the database when you call the SaveChanges() method. In the above example, context.Students.Add(std) adds a newly created instance of the Student entity to a context with Added EntityState. The context.SaveChanges() method builds and executes the following INSERT statement to the database. In the connected scenario, EF API keeps track of all the entities retrieved using a context. Therefore, when you edit entity data, EF automatically marks EntityState to Modified, which results in an updated statement in the database when you call the SaveChanges() method. In the above example, we retrieve the first student from the database using context.Students.First<student>(). As soon as we modify the FirstName, the context sets its EntityState to Modified because of the modification performed in the scope of the DbContext instance (context). So, when we call the SaveChanges() method, it builds and executes the following Update statement in the database. In an update statement, EF API includes the properties with modified values, other properties being ignored. In the above example, only the FirstName property was edited, so an update statement includes only the FirstName column. Use the DbSet.Remove() method to delete a record in the database table. In the above example, context.Students.Remove(std) marks the std entity object as Deleted. Therefore, EF will build and execute the following DELETE statement in the database. 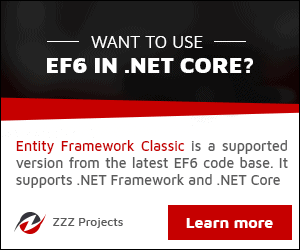 Thus, it is very easy to add, update, or delete data in Entity Framework 6.x in the connected scenario. Saving data in the disconnected scenario in EF Core.